While the military gets away with helping itself to the national coffers and the regime hierarchy line their pockets via kickbacks and shady deals, a park has been built on the cheap in Suva to help old folk. Fiji's elderly population is expected to become a problem by the year 2025 when people over 60 will make up 13 per cent. By 2050 one in four of the total population is expected to be 60-plus. The Minister for Social Welfare, Women and Poverty Alleviation, Doctor Jiko Luveni, says the country needs to do something about it and with supporters today started tilling land in Thurston Gardens that will be dedicated to senior citizens to gather and spend time. Reiterating the importance of the regime's National Policy Framework for the elderly, she raved about the park saying it was a first in the Pacific. “The construction is evidence of Government’s commitment to ensures that the most vulnerable in our community receive the help they need and to plan a future that gives Fiji’s senior citizens the services that matter most. The park will provide an ideal place for the senior citizens to make interactions, socialise and enjoy the recreational activities which will be organised for them." Luveni revealed that while the illegal government made the right noises, it did not put any money up. "We had no money, Ajay Amrit looked for it and found the money through the usual ready support of the Rotary Club of Suva and Suva City Council willingly approved this site that is actually second to none in terms of environment and connecting to the everyday lives of the children, the sports people.” The architect has agreed to work for free. Forty-five per cent of people are living in poverty according to reports but like the issue of the growing elderly population, the regime is lining its pockets and bankrupting the country while minor players are playing in the dirt and making silly speeches. 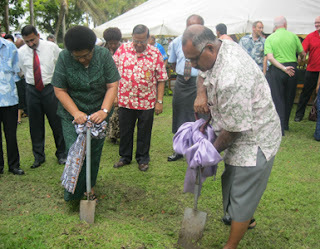 Picture: Luveni breaking ground at Thurston Park. Apart from parasites like walsh, smith johns, gates, pryde and the few others with their snouts in the trough feeding off Fijian misery, is there anyone else who actually believes this human rights abusing junta is a 'government'? Fiji and its devastated people are going backwards at a rate faster than the basket case Zimbabwe since Dec 2006 under this military regime. What contradiction...now Jiko upholds and values older folks for their maturity and experience but on the other hand her illegal Govt forces 50 yr olds to compulsory retirement, never mind their experiences gained since starting work. She sounds hollow, shallow just like her illegal master Bainisona. Tragically, people who were 27 years old and above in 1987, are now paying the price for the greed and egos of those involved in all the coups since 1987 and this will be Frank's legacy as it was Rabuka's for anyone beyond 2025 as Fijians take another 30 years to recover from their selfish acts. Sadly, it is many fijians themselves, not only Frank and Co. but many average Fijian Citizens in their support of the various coups and the implementers of those coups that are also responsible for the demise of Fiji's Economy. This i fear, will be typical of the next generation unless Fijians can look themselves in the mirror and admit the reality that is Fiji today. Those spades in the picture remind me of Qarase's affirmative action. So what is different now? Ever wondered? It is that Cokanasiga and Vosanibola could do jack sh*t, but a Taliban single handedly transformed the mighty RFMF from masters to lower than servants, thus wearing skirts effectively. Cant you idiots see that your traditional values are being tampered with, and your high chiefs, eg Ratu Inoke are being systematically exterminated? How would a muslim react if he was offered pork, or a hindu offered beef. cultural values, isnt it? So what is stopping you i-Taukei from preserving your cultural values at least? Are you content with this taliban tearing your identities to bits? Wake up morons!!! Fiji's neighbours,the silly ones like the new prime minister of Solomons, should be noting this pathetic and shallow spadework by regime. People like Mr Phillips being sucked in by the Fiji dictator, thinking they can help bring them into the fold and blaming Australia and New Zealand as they go. They so dumb, Fiji suffering but Bainimarama and his corrupt cohorts actually revelling in life in the fast lane while people of Fiji - young and old - are hurting. We need to return to an even playing field starting with elections asap. After that? We have to work together to make sure this current regime is not replaced by another corrupt one or we will be eating dirt again. Overseas ministers get free disabled parking for the elderly, free bus and train fares and discount vouchers at restaurants ...Fiji's elderly get a park! What will they do with a park? Talanoa? Meet and mingle? And who will drop them to the park? Give the elderly something useful, not a crap park which they can't do anything with. Might want to review your math. 13% is not one in four. Anon@ 9.41am: Stats from Luveni via govt website quote:"...the United Nations projections for Fiji indicated that in 2025 the elderly would account for 13 per cent of the total population. You're absolutely right. My mistake. Guess I need to work on early morning reading comprehension. What is the park for Luveniyali?You make sure that no Indian man comes to the park,because that is where my grandfather will find his busfare.It's an insult to our grandparents,for denying them their jobs,asking them to come and sit at the park,when they still can work and prepare themselves for retirement.I am fifty and still playing rugby,and am not prepared for anyone to call me old,even,still can give Bainijidamunivore a good bashing. Luveniyali,you are over fifty,would you come and sit at the park with your husband?I dont think so,you will be sitting at your holiday home somewhere on the beach.The only thing i understand is that,the park,is prepared for the illegal governments retirement,for those that are over fiffty and are illegally working,Bainijidamunivore,Naulukau,Ganitaveuni,Kubu,Ae,naarse,Naivuluarua,Filipe Boci,Share"on,Christopher Bribe,including you Luveniyali,but am so sorry,the Naboro prison will welcome you with open arms. Forget Naboro - develope Nukulau as a working theme park. Can have drive by tours - meet & greet on the beach - they'll all be there - Frank - would be Vunivalu - Taveuni squatter - Rambo - etc etc.